Travel packing tips are essential and savvy travelers always seem to research every time they travel. Whether it’s area-specific packing tips or a more general packing technique. And whether you’re someone who just started to pack better or a seasoned packer in need of a reminder, here are some ideas! Travel packing tips #1: Never underestimate a packing list. Planning is key to light packing. Think of where you’re going, the weather, your activities, and how long are you traveling? Write down the most basic things you need to bring. Creating packing categories would help you a lot in giving you the complete idea of what you’re going to bring. Overpacking is everyone’s greatest packing sin. And we’ve all been there. We’ve all done that. A packing list will help you avoid all the what-ifs you’ve been thinking of bringing. It’s not too much work to compose a packing list first and foremost. Writing them down helps direct you in your packing better. Travel packing tips #2: Roll, don’t fold. Folding your clothes takes up so much space. Fold them instead. This is an age-old technique that help squeeze in your clothes and other fabrics better. Rolling your clothes make your clothes as compact as possible as opposed to letting them laid out. It’s also so much easier to take your rolled clothes out as they’re laid out vertically. This is opposed to taking out folded clothes you stack on top of each other. Packing cubes for the win. Enough said. Packing organizers have been nothing short of revolutionary for many people. They had changed the way I travel. And not including packing organizers in travel packing tips is just sin. Some people prefer all of their clothes (tops & bottoms) inside 1 packing cube and they use another cube for storing underwear. That way, they can fit more stuff they need. 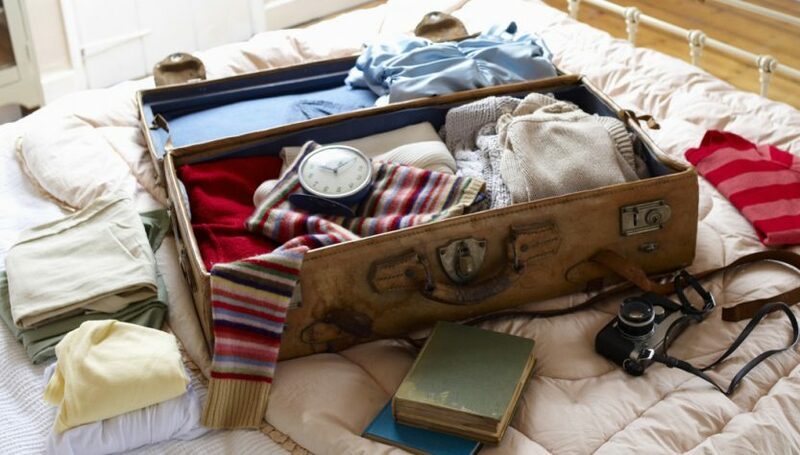 Everything depends on how many things you want to bring and how you want to organize them to ease your travel. You’re a business traveler and you need your clothes in perfect conditions? Get packing folders. Their purpose is to limit the creases of your clothes as they stay in your suitcase. #4 Plan your outfits and layer, layer, layer. Regardless of the season, layering your outfits is one of the best travel packing tips to minimize your packing. Layering gives variations to your outfits without having to bring a completely new set. You can make use some of the most versatile items for layering. Blazer, jackets, cardigans, pashmina, bring what you like most to wear and works for you. Items that can be used for more than one purpose are my favorites. Shawls, blanket scarfs, pashmina, you name it. Not only they could perfectly act as outerwear in certain climates and weather; they also serve as a makeshift blanket for flights. They’re also very versatile and therefore, a joy to style. #6 If packing light is your priority, go for neutral colors! When it comes to outfit, neutral colors are key to help you pack lighter. Is your wardrobe already primarily consisted of black and white pieces? Then you are free to skip this one. Packing monochrome and/or neutral colors makes coordinating clothes and styling so much easier for you. This is especially helpful when you did not have time to plan your travel outfits. This way, you’ll know that every single piece of your clothes will match each other. And don’t worry that you’ll be “boring”. Black clothes and neutral tones are timeless. You can’t go wrong with them. #7 Mock-packing with a carry-on. The most straightforward travel packing tips for light packing? Downsize your bag! “Upgrade” to a smaller bag gradually. But if you’re not in a position to do this yet, then mock-packing with only a carry-on is a solid way to start. Overpacking is the sin of every traveler. Do you plan on bringing the largest suitcase you could find because you know you’re going to shop a lot? Forget about it. Bring out your carry-on suitcase first. Take a look at your packing list. 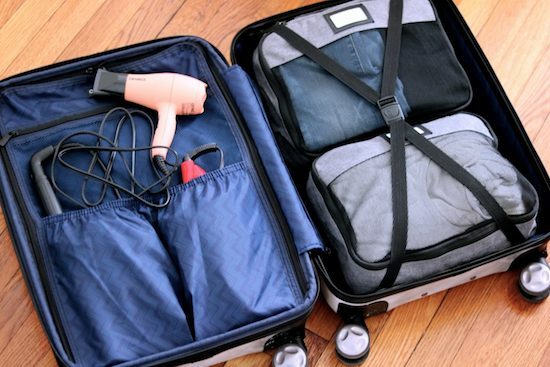 Practice your packing with a carry-on. Once your options are limited to a rare minimum (in this case, a carry-on), you’ll automatically not think of the what-ifs. And chances are, you’re not going to need any more aside from what you’ve already tried packing into your carry on. This way, you’ll leave plenty of space for your shopping at your destination. Ziploc bags can be very versatile. This is especially important if you plan to only bring a carry-on. Get your travel-sized toiletries inside the ziploc bags to get them through security smoothly, especially when you’re flying internationally. If you’ve been using travel organizers well, then this likely won’t be a big problem for you. Ziploc bags can also be used to protect your devices such as a smartphone when the weather’s not so friendly and you’re stuck outside. #9 Pack some snacks for yourself. Bringing your own snacks is one of the most underrated packing tips. During travels, there’s bound to be something unexpected happening. Planes delayed, getting lost while looking for addresses, and many other unexpected things could happen. On the road or in the sky, having your own snacks packed with you can be life-saving. Here are some ideas for some good travel food you can bring. Not buying snacks every time the hunger pangs hit would also save you some money you can use for much better things. Security is one of the top concerns when it comes to traveling. And a more dedicated travel packing tips would depend on what stuff you’d bring and what you’re protecting them from. The weather, a fall, a thief? We all love our high-definition travel memories. Things like camera may need its own special care. So here are quick tips for packing your camera that also applies to other fragile items as well. 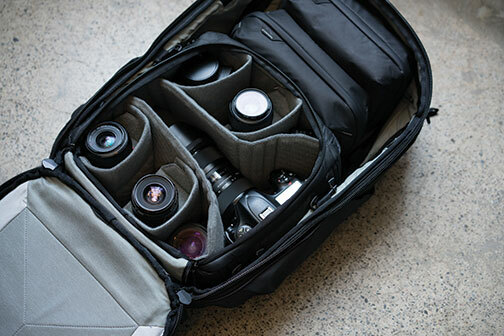 Example of a dedicated camera bag. Turn your clothes into makeshift padding if you can’t invest in one just yet. Padding! Lots of padding. But what about traveling light? If you’re not at the stage that you’d afford a dedicated camera bag of your own, then your clothes should serve as makeshift padding. Experiment on positioning in your suitcase or backpack that works best for you. Waterproofing. Not all travelers will need waterproofing. Whether you need it or not would depend on many factors; your destination, your activities, and of course, the weather forecast. Think about whether your fragile devices would need a waterproofing inside your bag, or on an outing during your travel.